Fast, shaky and a little... (is that pizza?!) ...distracted. Because of his small size, he prefers to move in groups. He feels safer that way. 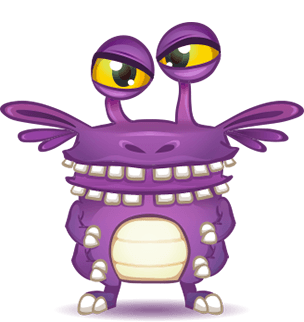 Jitters is the fastest non-flying UnMonster. Feels awkward around everyone. Including himself. Tizzy will try to avoid anything that has to do with socializing. Don't even ask us how we got him in the group picture. He will usually hang around some dark corner, minding his own business. If overly helpful and attached had a single name, it would be Fretta. When she decides to stick around, it's really hard to say no just once. Hint: try twice. Curious, slimy slug. Multiplies out of boredom. Our researchers tried their best to replicate his shape. 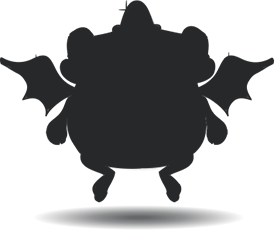 His main abilities seem to be: flying and being extremely annoying. 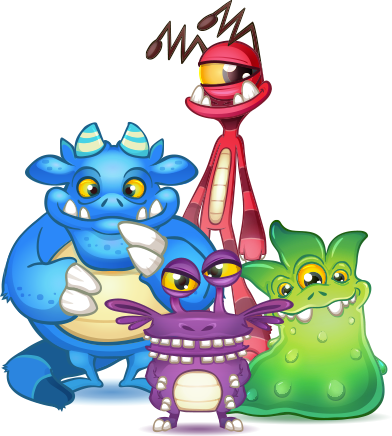 The UnMonsters are loose, but don't let that scare you. You can round them up with a lasso for more points or hold & drag them one by one if you need to rearrange where they are. Feel like you're getting overrun too fast? 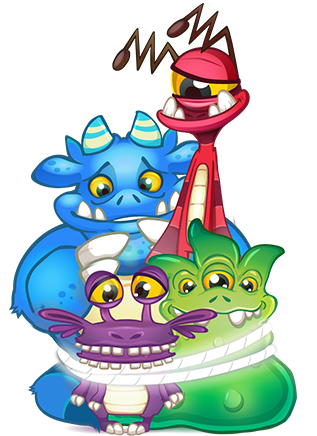 Pick up some power-ups to help you get rid of the bigger UnMonster waves. You get 4 diffrent ones each time you play. 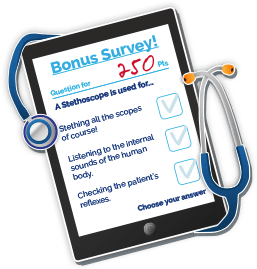 Each rounds gives you an opportunity to answer a simple health-related question. Do you know how many servings of dairy you should be eating in a single day? A correct answer gives you additional points to stack on top of your High Score. …but they can't get in. The handle has green slime all over it. We’re no police detectives, but it seems like the UnMonsters took that room over too. We bet you can help our patients get it back! We also have a Surgery! You must scrub very well before you can enter, because this is where our doctors perform surgeries. 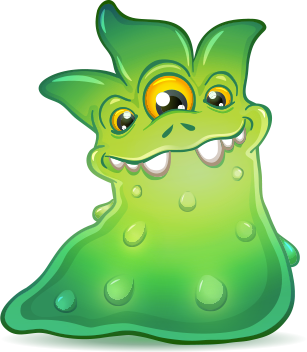 It looks like the UnMonsters may have contaminated it. No surgeries until we get all the UnMonsters out! Caught 10 Tizzys in one loop? Got 1000 points? Impossible! Or is it? Survey Time: Do you think you know all the answers? Test your children's wellness and safety knowledge and gather bonus points at the end of the round. There’s a Tizzy in your nice little Jitters herd? No problem! Hold & drag them out of the way! What’s a Tizzy or a Jitters? We get this a lot. 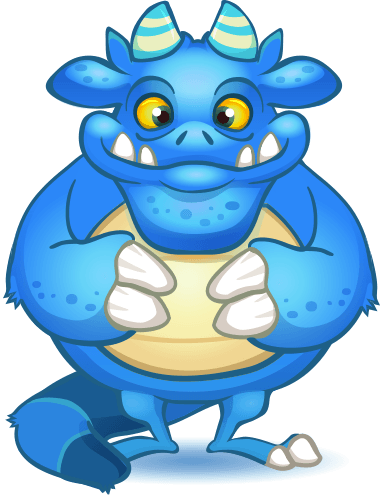 Loading screens now identify the UnMonsters, so you can call them by their proper names. No one likes to be called ‘The Purple One’. Now we can't contain them... Help us! 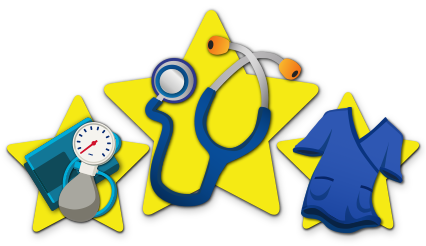 All our physicians and nurses specialize in pediatric care and treat only children 24/7. Your child will have access to any pediatric specialist who can treat his or her condition. We even have child life specialists who help children understand and cope with diagnosis and procedures through age appropriate play techniques. 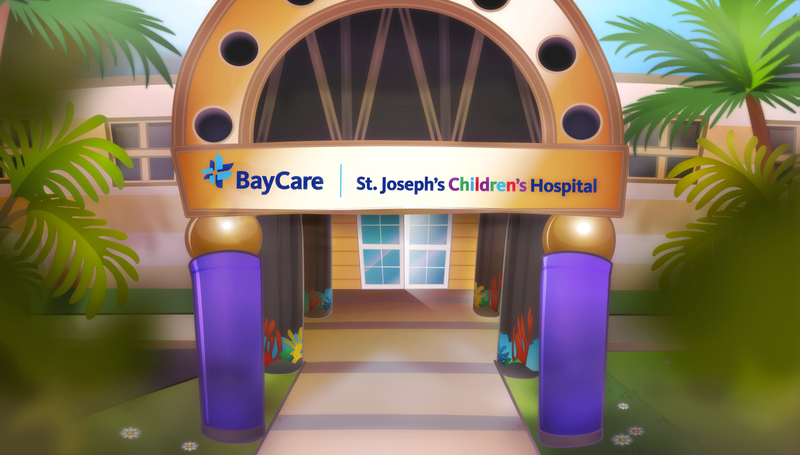 At St. Joseph’s Children’s Hospital, we treat more children than any other hospital in Tampa Bay, so you can rest assured your child will receive the best expert care close to home in Tampa. We are part of BayCare, the largest health care provider in Tampa Bay. You can also choose from hundreds of pediatricians and pediatric specialists located throughout the Tampa Bay area. In addition, we offer imaging, lab services, pediatric rehab and speech therapy at BayCare's conveniently located facilities. The experts and expertise of St. Joseph’s Children’s Hospital are also available at the pediatric units at Mease Countryside Hospital in Safety Harbor, and St. Joseph's Hospital-South in Riverview. For a referral to one of our pediatricians or pediatric specialists: Call (888) 487-0183. At St. Joseph’s Children’s Hospital, we believe that the best judges of the care we provide are the children we treat and the many families we touch. 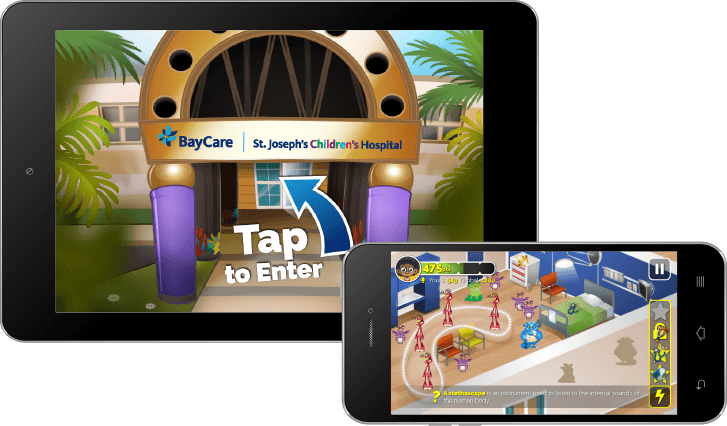 Watch as our patients tell their inspiring stories and find out what St. Joseph’s Children’s Hospital is all about.